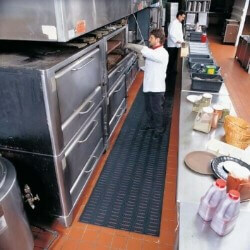 Traction Mat® is a 3/8" thick, solid surface multi-purpose mat made from general purpose (Black), standard (Brown), and heavy-duty (Red) rubber compounds for varying degrees of grease and oil protection. 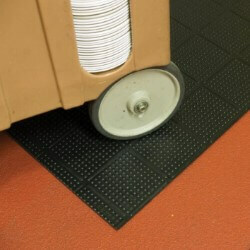 Traction Mat® is available in sheet sizes or rolls for longer length application requirements. 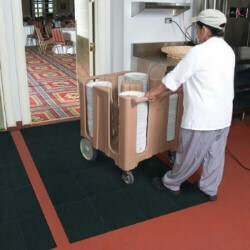 A non-skid surface increases traction and a low profile allows for easy cart access. .
1. 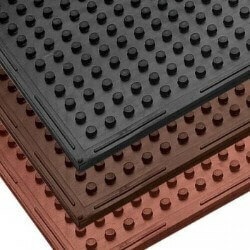 Available in general purpose (Black), standard (Brown), and heavy-duty (Red) rubber compounds for varying degrees of grease and oil protection. 2. Non-skid surface for added traction. 3. Low profile for easy cart access.